Every time I ask a client this question, the answer is always definitive! People know exactly which side of the “wrapper” they’re on. My answer – I’m a whole chocolate type of person. I can say that easily now, without resentment for myself, without judging myself or without feeling guilty. But you know, this wasn’t always the situation. For so many years, probably decades I beat myself up because I wasn’t the 1-block of chocolate person. Why didn’t I have more willpower, why couldn’t I be more disciplined, why was it so hard to only have 1 block of chocolate? What the heck was wrong with me? Can you relate to this conversation? And maybe it’s not chocolate. Maybe it’s something else, maybe it’s cashews or chips or ice-cream or maybe it’s not even food. Maybe it’s TV or shopping or Facebook – where you just can’t get enough, you can’t seem to stop yourself. Somehow a little just never seems enough to be satisfied. What I’ve always known intuitively but now understand scientifically is that this is not just about feeling full. It’s about feeling satisfied and if you’re like me, one block of chocolate just won’t do it. But why? It has to do with the genetic expression of genes like DRD2, FTO and COMP. My mentor and dear friend, Dr. Mansoor Mohammed, a world-renowned geneticist explained the following to me when I had my genetic profile tested last year. Certain of these gene expressions result in either less dopamine being produced or fewer dopamine receptors available resulting in diminished dopamine binding or if you’ve hit the “genetic jackpot” like me, there is a combination of both of these at play. This affects amongst other things the reward circuit in your brain where your sense of pleasure or satisfaction is managed (or not). The end result – diminished intensity of the pleasure response. Meaning…someone with this gene expression (like the person writing this blog ) would need more chocolate that another person with the opposite gene expression to experience a similar level of satisfaction. This “weakened” gene expression could also increase the likelihood of developing unhealthy eating or addictive behaviors. So how does all this information help if it’s something we cannot control? It sheds light and understanding on our natural patterns and behaviors. In my case it helped explain, in part, my struggle with an eating disorder for nearly two decades. I saw based on scientific evidence that there is far more to this struggle than the apparent lack of will power, self-discipline or motivation. 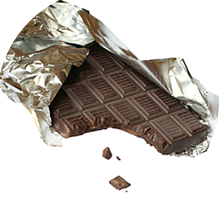 From a practical standpoint it confirmed the critical importance of what I intuitively have done and recommended for decades – develop specific strategies around portion control, create a healthy food environment at home and have a plan for when you eat out to help manage the “whole chocolate bar” dilemma. The good news is that there are multiple, simple strategies you can adopt to manage your portions and health so your genes don’t affect your jeans. In Part 2 of ‘What’s your eating profile?’ I’ll share by top 5 strategies with you. Great, interesting and valuable info… Thanks! I am a whole bar of chocolate kind of gal. I can see that it is a natural tendency for me to do lots of things to excess. Sometimes that works, sometimes it gets me in trouble. Identifying “what’s enough” is a constant stress point for me in several areas of life. I can see the pattern clearly. Denise I absolutely relate to what you are saying. In my next blog I will give you some strategies, granted particularly around food about how you can manage this better and make things easier for yourself. Thanks so much for sharing your thoughts! I felt as if you were talking directly about and to me! That is EXACTLY how I feel/react to chocolate – all or nothing. For too long, too many people with combos as described in your blog, have had their eating / food issues and struggles dismissed or been told all they need is to harness their willpower. Thank you for exposing the genetic component and strategies to deal with it. Thanks so much Marlene! I couldn’t agree with you more about how people with food issues are too often dismissed and just told to be more committed. Clearly it is not always that simple! Lauren, you write like you are talking to me ! You are so talented. This is fascinating. I am the whole block with licorice and gummies too . Now I ‘know’ why ! I can’t wait for your next blog . Thanks for sharing your knowledge – you are loaded with great information . You are so brilliant Lauren. I think often the worst thing people do to themselves is put unrealistic pressures and expectations on who they are and who they think/wish they should be. This article is validating, but not in a way that means you succumb to an unfulfilling destiny.. more in a way that understanding who you are gives you more power and control. I am definitely a whole bar person (I feel like this is a family gene…) and have so often had negative, harsh thoughts associated with my lack of self-control and will power. This article has given me so much to think about.. can’t wait to the follow on! Thanks so much for sharing your insightful thoughts Elene. I have no doubt so many people can relate to what you shared. I am so grateful for this article. It’s very timely for me. I’m excited to read more! I’m so happy to hear that Susan! Part 2 comes out tomorrow I hope you enjoy it just as much!